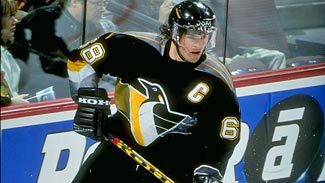 The Pittsburgh Penguins' consolation prize for missing the playoffs on the last night of the 1989-90 season was the chance to draft Jagr, a Czech teenager who grew into the most prolific European-born scorer in NHL history. He signed with the Dallas Stars this summer and will begin 2012-13 with 665 goals and 1,653 points, as well as the two Stanley Cups he won with the Penguins. His name won't ring a bell to a lot of fans, and his scoring numbers look small by the standards of today's 82-game season, but Jackson was a terrific player -- a four-time First-Team All-Star and winner of the Art Ross Trophy in 1931-32, when he led the Toronto Maple Leafs to the Stanley Cup. He had five 20-goal seasons when teams played 48 games. It took Jokinen a while to get on track after the Los Angeles Kings made him the third player picked in 1997, but he's gone on to a more-than-satisfactory career that's been diminished by making only one trip to the Stanley Cup Playoffs. Jokinen, who signed with the Winnipeg Jets this summer, will surpass 300 goals and 700 points after reaching the 1,000-game mark last season. Yes, he was helped by playing most of his career with Wayne Gretzky. But Gretzky was helped, too, by playing with one of the top sharpshooters of the 1980s and '90s. Kurri was the first Finnish-born player to break the 600-goal mark, made the postseason All-Star team five times in six seasons, and was on all five of the Edmonton Oilers' Cup-winning teams. Not many players could spend the first 12 seasons of his career as an elite defenseman and seven more as a superb two-way center, but Kelly did. He piled up 282 goals and 823 points in 1,316 games for the Detroit Red Wings, where he excelled on defense, and the Toronto Maple Leafs, where he became a center. Kelly won four Cups with each team and was a six-time First-Team All-Star. Norris Trophy winner Erik Karlsson may pass him one day, but for now, "Kipper" is the best of the current-day "K's." He's won 35 or more games for the Calgary Flames in each of the past seven seasons and will begin the new one with 311 victories despite not becoming an NHL regular until he was 27. How do you decide between two of arguably the top 10 players of all time? Lemieux piled up 1,723 points in 915 games and might have threatened Wayne Gretzky's records if not for injuries and illness. Lidstrom retired this summer after 20 seasons in which he won the Norris Trophy seven times and staked his claim as the best defenseman since Bobby Orr. Lafleur was the dynamo who drove the Montreal Canadiens' dynasty to four consecutive Stanley Cups in the late 1970s. Leetch is arguably the best American-born player (and best New York Rangers player) ever, and though he won only one Cup, he earned the Conn Smythe Trophy as playoff MVP in 1994 when the Rangers snapped a 54-year championship drought. The newly crowned Vezina Trophy winner from the New York Rangers has won 30 or more games in each of his first seven seasons, an NHL record -- and an amazing accomplishment for a seventh-round draft pick who wasn't even expected to make the team when he arrived at Rangers' camp in 2005. Lost in all the talk about Messier's leadership skills was the fact he piled up tremendous offensive numbers. He's second all-time to Wayne Gretzky, his longtime Edmonton Oilers teammate, in points with 1,887, including 694 goals. He won five Cups with the Oilers, including one after Gretzky was traded, and added a sixth with the New York Rangers -- scoring the winning goal that ended hockey's longest championship drought. Mikita won four scoring titles in a five-year span in the 1960s and finished his career with 1,467 points, including 541 goals. MacInnis terrified goaltenders with one of the game's most ferocious slap shots on the way to 340 goals and 1,274 points in 1,416 games with the Calgary Flames and St. Louis Blues. In the pre-war era, Morenz was known as the "Babe Ruth of Hockey" and won three MVP awards and two scoring titles while helping the Montreal Canadiens to four titles. He's still somewhat in the shadow of Crosby in Pittsburgh, but Malkin doesn't have to play second fiddle to anyone. In six seasons, he's won the Calder Trophy as the top rookie in 2006-07, two scoring titles, the Conn Smythe Trophy as playoff MVP in the Penguins' run to the 2009 Stanley Cup, and the Hart Trophy as last season's MVP. That's a lot to achieve before you turn 26. Few players combined scoring skill and muscle the way Neely did after he was traded from the Vancouver Canucks to the Boston Bruins in 1986. He had three 50-goal seasons -- including one in which he had 50 goals in 49 games -- and only 10 players in NHL history have a better goals-per-game average. Niedermayer, a four-time Stanley Cup winner, was one of the best skaters ever to man an NHL blue line. Nieuwendyk, a 500-goal scorer, won the Cup with three teams -- including his final one as a teammate of Niedermayer on the New Jersey Devils in 2003. The newest New York Rangers star comes to the Big Apple after eight seasons and 289 goals with the Columbus Blue Jackets, for whom he owns virtually all of the franchise's career scoring marks. He's had 30 or more goals in each of the past five seasons. There has not been another player like Orr, and there may never be one again. 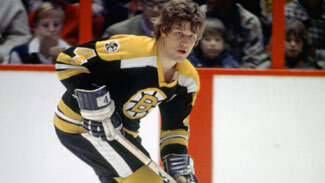 He revolutionized the game in the late 1960s by becoming the first defenseman to actually lead the attack. He won the Norris Trophy eight times (still a record), and had knee problems not intervened, he might be known today as the greatest player of all time. Ovechkin averaged 48 goals and 97 points through his first seven NHL seasons and could break the 500-goal mark before his 30th birthday. Oates will be Ovechkin's coach this season after being hired by the Washington Capitals on the same day he was named to the Hockey Hall of Fame. How great a scorer has Ovechkin been? There have been 17 50-goal seasons since he entered the NHL in 2005; he has four of them. No one else has more than two. His 65 goals in 2007-08 are the most in a season in the 21st century. Plante is on the short list when the discussion turns to the greatest goaltender in NHL history. He won six Stanley Cups with the Montreal Canadiens, including five in a row, and finished his career with 437 wins, a 2.38 goals-against average and 82 shutouts -- plus a 71-36 record and 14 shutouts in playoff competition. Potvin was one of the four cornerstones of the New York Islanders' dynasty and retired as the all-time scoring leader among NHL defensemen. Parent won the Conn Smythe Trophy in both of the Philadelphia Flyers' Stanley Cup seasons and was the reason the Broad Street Bullies were able to play the way they did without fear of drowning in a sea of power-play goals. The 2011 Hart Trophy winner was the only player to score 50 goals in 2010-11, becoming the first Anaheim Ducks player in 12 years to win the Rocket Richard Trophy and the first to capture the MVP award. Perry has averaged 32 goals in his six full NHL seasons and already owns a Stanley Cup ring and an Olympic gold medal. The only Hall of Famer whose last name starts with "Q" was considered one of the NHL's best puck-rushing defensemen from the mid-1940s through the mid-'50s. He was a three-time First-Team All-Star as well as one of the few defensemen to win the Lady Byng Trophy. He finished his career with almost three times as many points (284) as penalty minutes (95) in 774 games. Quick has gone from a placeholder to a Conn Smythe Trophy winner with Los Angeles after leading the Kings to the first Stanley Cup in their history last season. Quintal played 1,037 games as a reliable defenseman, most notably with his hometown Montreal Canadiens. Should he continue playing at the level he has been, Quick could surpass Quackenbush as the best of the "Q's." He's won 109 games in the past three seasons while cutting his goals-against average from 2.54 to 2.24 to 1.95 in 2011-12, then put up a microscopic 1.41 GAA while leading the Kings to the Cup.